Dwyane Wade speaks after the final game of his career. Dwyane Wade finishes his last NBA game with 25 points, 11 rebounds and 10 assists. Dwyane Wade looks back on his career following him recording a triple-double in his final game. LeBron James looks back on his relationship with Dwyane Wade during his final NBA game. Dwyane Wade is mic'd up for his last NBA game against the Brooklyn Nets. Dwyane Wade is greeted by his Banana Boat crew (LeBron James, Chris Paul, Carmelo Anthony) before his last NBA game. Appeared in 74 games (73 starts) and averaged 19.0 ppg (.456 FG%, .793 FT%), 4.6 apg, 4.1 rpg, 1.07 spg and 30.5 mpg … started the All-Star Game in Toronto for the Eastern Conference … selected NBA Eastern Conference Player of the Week for the week ending 1/31 … ranked among the NBA leaders in scoring average (24th) and assists per game (28th) … led the Heat in points scored, FGM and FGA, FTM and FTA, double-figure scoring efforts, 20-point games and steals, and tied for the team lead in starts and 30-point games … ranked second on the team in scoring average, FT%, assists, blocks and dunks and tied for second in games played … topped Miami in scoring a team-high 33 times, in assists 30 times, in steals on 24 occasions and in blocks eight times … scored in double figures 67 times, including 35 games with 20+ points and three games with 30+ points … recorded two double-doubles … scored his 20,000th career point on 3/19 vs. CLE becoming the 41st player in NBA history to reach that milestone … grabbed his 4,000th career rebound on 1/26 at BKN … connected on his 7,000th career field goal on 12/29 at MEM … hit his 5,000th career free throw on 1/9 at UTA … recorded his 750th career block on 3/14 vs. DEN … recorded his 1,000th career dunk on 11/3 vs. ATL … grabbed season-high 10 rebounds at LAL (3/30) … scored season-high 32 points vs. GSW (2/24) … dished season-high 11 assists at GSW (1/11) … recorded season-high 5 steals vs. BOS(11/30) … missed six games due to injury, was a DNP-CD once (3/12) in a game he had a bruised left thigh and missed one game due to personal reasons. 2016 PLAYOFFS: Started all 14 games for the Heat and averaged 21.4 ppg (.469 FG%, .781 FT%), 5.6 rpg, 4.3 apg and 33.8 mpg … led the team in points, scoring average, assists, FGM and FGA and FTM and FTA and ranked 2nd in steals and blocks … topped the Heat in scoring a team-high seven times … scored in double figures in all 14 games to extend his streak of scoring 10+ points to 49 consecutive postseason games (the second longest streak of his career) … scored 20+ points in eight of the 14 games and tallied two 30-point games … handed out double-figure assists once and posted one double-double … had back-to-back 30-point performances in Game 3 on 5/7 with a game-high 38 points and in Game 4 on 5/9 (both in Miami) with a game-high 30. Has appeared in 855 regular season games (845 starts) in his 13-year NBA career and has averaged 23.7 ppg, 5.8 apg, 4.8 rpg, 1.65 spg, and 35.7 mpg while shooting .488 from the floor, .284 from 3-point range and .767 from the foul line … in 11 trips to the postseason has played in 166 games (166 starts) and averaged 22.8 ppg, 5.3 rpg, 5.0 apg, 1.6 spg and 1.0 bpg in 38.4 mpg … is Miami’s all-time postseason leader in points, FGM and FGA, FTM and FTA, defensive and total rebounds, assists, double-figure scoring games, 20-point games, 30-point games, 40-point games, steals, games, minutes, starts and dunks … closed the 2015-16 season ranked 39th on the NBA’s all-time scoring list … left the Heat as Miami’s all-time leader in games played, points, FGM and FGA, FTM and FTA, double-figure scoring efforts, assists, steals, starts and minutes. Played in 62 games (62 starts) and averaged 21.5 ppg (.470 FG%, .768 FT%), 4.8 apg, 3.5 rpg, 1.18 spg and 31.8 mpg … selected as an Eastern Conference reserve for the NBA All-Star Game in New York but did not play due to right hamstring injury … selected as the NBA Eastern Conference Player of the Week for the week ending 3/22 … ranked among the NBA leaders in scoring average (11th) and assists per game (26th) … led the Heat in points scored, scoring average, FGM and FGA, FTM and FTA, double-figure scoring efforts, 20-point games and 3-point plays (27) … topped the Heat in scoring a team-high 35 times and also led Miami in assists a team-high 29 times, in steals 18 times, in minutes and blocks seven times each and in rebounds twice … hit a career-high 31 consecutive free throw attempts from 12/23 to 1/4 … scored in double figures on 58 occasions, including 37 games with 20+ points, seven games with 30+ points and two 40-point performances … posted three double-doubles … recorded season-high 5 steals vs. CLE (3/16) … blocked season-high 3 shots at IND (12/31) … scored his 18,000th career point on 12/27 vs. MEM … scored season-high 42 points vs. UTA (12/17) … grabbed 11 rebounds vs. TOR (11/2) … dished season-high 10 assists three times. Appeared in 54 games (53 starts) and averaged 19.0 ppg (.545 FG%, .733 FT%), 4.7 apg, 4.5 rpg, 1.46 spg and 32.9 mpg … started the All-Star Game in New Orleans for the Eastern Conference … was named the Eastern Conference Player of the Week for the week ending 12/22 … ranked 8th in the NBA in FG%, and it was also his career high for a season … ranked 2nd on the team in FG%, scoring average and 20-point games … topped the Heat in scoring 13 times and also led Miami in steals 17 times, assists 13 times and in blocks on 11 occasions … scored in double figures 48 times, including 28 games with 20+ points and two 30-point efforts … posted two double-doubles … connected on his 350th career 3-pointer vs. DET (2/3) … had his career-best streak of 405 consecutive starts snapped when he came off the bench on 1/26 vs. SAS after sitting out the previous four games to rest … recorded season-high 3 blocks at PHI (1/17) … scored his 17,000th career point at NYK (1/9) … scored season-high 32 points vs. IND (12/18) … dished season-high 12 assists vs. PHX (11/25) … recorded a career-high 8 steals vs. DAL (11/15) … grabbed season-high 10 rebounds twice … missed 13 games due to assorted injuries and 15 games to rest as part of his maintenance program. 2014 PLAYOFFS: Started all 20 games for the Eastern Conference Champion Heat and averaged 17.8 ppg (.500 FG%, .767 FT%), 3.9 rpg, 3.9 apg, 1.50 spg and 34.6 mpg … topped the Heat in scoring three times and in steals eight times, rebounds seven times … the only member of the team to score in double figures in all 20 games … had seven 20-point efforts … averaged 15.2 ppg (.438 FG%, .692 FT%), 3.8 rpg, 2.6 apg, 1.60 spg and 34.4 mpg in the NBA Finals vs. SAS … became Miami’s all-time postseason leader in total rebounds in Game 2 at SAS (6/8). Played in 69 games (69 starts) and averaged 21.2 ppg (.521 FG%, .725 FT%), 5.1 apg, 5.0 rpg, 1.86 spg and 34.7 mpg … voted to the starting lineup for the Eastern Conference at the All-Star Game in Houston … selected the NBA Eastern Conference Player of the Week for the week ending 3/10 … ranked among the NBA leaders in scoring average (8th), points (13th), steals (6th), FTM (12th) and FTA (10th), FGM (15th) and FG% (19th) … joined Russell Westbrook and teammate LeBron James as the only players to average at least 20 points, 5 rebounds and 5 assists … topped the Heat in scoring 16 times and led Miami in steals 23 times, in assists on 20 occasions, in minutes and blocks 15 times each and in rebounds in nine games … scored in double figures 67 times, including 43 games with 20+ points and eight 30-point performances … shot at least .500 from the floor and scored 20+ points in 11 consecutive games from 2/23 to 3/13, becoming the first guard to accomplish the feat since Michael Jordan did it in 11 consecutive games from 12/30/95 to 1/23/96 … recorded a steal in a career-high 23 consecutive games from 1/25 to 3/12 … scored his 15,000th career point in the season opener vs. BOS … when he blocked his 50th shot of the season at CHI (3/27) it marked the eighth time in his career he blocked at least 50 shots in a season, joining him with Michael Jordan as the only guards in NBA history to block 50+ shots in eight different seasons … recorded his 4,000th career assist at TOR (3/17) … recorded season-high 6 steals vs. IND (3/10) … tied his career high with 19 FGM vs. SAC (2/26) and scored season-high 39 points … grabbed season-high 12 rebounds vs. CHA (2/4) … dished season-high 10 assists twice and recorded season-high four blocks twice … missed a total of 12 games due to injury and one game (12/28) while serving an NBA suspension. 2013 PLAYOFFS: Started all 22 games in which he appeared for the NBA Champion Heat and averaged 15.9 ppg (.457 FG%, .750 FT%), 4.8 apg, 4.6 rpg, 1.73 spg, 1.05 bpg and 35.6 mpg … missed one game due to injury … tied for the team lead in offensive rebounds and ranked second in minutes, points, scoring average, FGM and FGA, FTM and FTA, assists, steals and blocks … topped Miami in scoring three times and also led the team in steals eight times, assists and blocks six times each … scored in double figures 20 times, including five games with 20+ points and one 30-point effort … posted two double-doubles … hit 10 consecutive FGA from 5/8-10, tying for the second longest streak by any player in the 2013 NBA Playoffs … matched his postseason career high with 6 offensive rebounds in the Game 7 victory over IND (6/3) … had a pair of double-doubles in the Finals, including a 23 pts/10 reb (his 2013 postseason high) performance in Miami’s Game 7 victory over SAS (6/20). Played in 49 games (49 starts) and averaged 22.1 ppg (.497 FG%, .791 FT%), 4.8 rpg, 4.6 apg, 1.67 spg, 1.29 bpg and 33.2 mpg … started the All-Star Game in Orlando and recorded the third triple-double in All-Star Game history with 24 points (11-15 FGs), a game-high 10 rebounds and a team-high 10 assists in 33 minutes … ranked among the NBA leaders in FG% (20th) … topped the Heat in points 16 times, in blocks 20 times, in steals on 18 occasions and in assists in 15 games … scored in double figures 48 times, including 32 games with 20+ points and eight 30-point performances … grabbed season-high 11 rebounds at PHI (3/16) … scored season-high 36 points at CHI (3/14) … made a season-high 27 consecutive free throw attempts from 2/5-13 … recorded season-high 5 steals vs. NYK (1/27) … dished season-high 10 assists three times and recorded 4 blocks twice … missed a total of 13 games due to injury and was a DNP-CD on four occasions. 2012 PLAYOFFS: Played in 23 games (23 starts) for the NBA Champion Heat and averaged 22.8 ppg (.462 FG%, .729 FT%), 5.2 rpg, 4.3 apg, 1.70 spg, 1.30 bpg and 39.4 mpg … led Miami in blocks and ranked second in points, scoring average, FGM and FGA, FTM and FTA, assists, steals and minutes … topped the Heat in scoring twice and also led Miami in blocks 11 times, in steals 10 times and in assists on seven occasions … scored in double figures 22 times, including 17 games with 20+ points, two games with 30-or-more points and one 40-point effort … grabbed double-figure rebounds once and posted one double-double … had his left knee drained prior to Game 3 at IND (5/17) and was held to five points in the contest, snapping his streak of scoring in double figures in postseason play at a franchise-record 91 games … posted his lone double-double of the 2012 postseason with a 41 pts/10-reb effort in Game 6 at IND (5/24). Played in 76 games (76 starts) and averaged 25.5 ppg (.500 FG%, .758 FT%), 6.4 rpg, 4.6 apg, 1.46 spg, 1.14 bpg and 37.1 mpg … was a starter for the Eastern Conference in the All-Star Game … three-time Eastern Conference Player of the Week and shared the Eastern Conference Player of the Month honors for December with teammate LeBron James … set single-season career highs in offensive, defensive and total rebounds … ranked among the NBA leaders in scoring average (4th), FTA (6th), FTM (7th), FGM (9th) and FGA (10th), minutes per game (16th), steals per game (17th) and blocks per game (24th) … led the Heat in conventional 3-point plays and dunks, and tied for the lead in 30-point games and 40-point games … topped the Heat in scoring 37 times, in steals 34 times, in blocks on 29 occasions, in minutes 24 times, in assists 21 times and rebounds in 19 contests … scored in double figures 74 times, including 57 games with 20+ points, 25 games of 30-or-more points and four 40-point performances … grabbed double-figure rebounds 10 times … posted 10 double-doubles and one triple-double on 2/4 at CHA (included season-high 10 assists) … recorded career highs in both defensive (13) and total rebounds (16) at NYK (1/27) … scored season-high 45 points at HOU (12/29) … played his 500th career game on 12/20 vs. DAL … notched season-high 5 blocks three times) … missed a total of five games due to injury and was a healthy scratch on the Inactive List for the regular season finale (4/13). 2011 PLAYOFFS: Played in 21 games (21 starts) and averaged 24.5 ppg (.485 FG%, .777 FT%), 7.1 rpg, 4.4 apg, 1.62 spg, 1.33 bpg and 39.4 mpg … led the team in points, scoring average, FGM, FG%, FTM and FTA and tied for the team lead in FGA and dunks … topped Miami in scoring a team-high nine times, in assists eight times, in blocks on seven occasions, in steals six times and in rebounds in five games … scored in double figures in all 21 games, including 15 games with 20+ points and five 30-point performances … posted five double-doubles. Played in 77 games (77 starts) and averaged 26.6 ppg (.476 FG%, .761 FT%), 6.5 apg, 4.8 rpg, 1.84 spg, 1.06 bpg and 36.3 mpg … started the All-Star Game in Dallas and was named MVP after tallying a game-high 28 points, a team-high 11 assists, 6 rebounds and a game-high 5 steals in 31 minutes to become just the 12th player in NBA history to capture MVP honors in both the NBA Finals and All-Star Game during his career … was a two-time NBA Eastern Conference Player of the Week (weeks ending 3/7, 3/28) and one-time Eastern Conference Player of the Month … ranked among the NBA leaders in points (3rd), FGM (4th), FTM (4th) and FTA (4th), steals (4th), scoring average (5th), FGA (5th), total assists (8th), assists per game (10th) and blocks per game (29th) … joined LeBron James as the only players in the NBA in 2009-10 to finish in the Top 10 in points, assists and steals … his 82 blocks were tops among guards in the NBA … led the Heat in points, FGM and FGA, FTM and FTA, assists, steals, dunks and minutes … topped both 2,000 points and 500 assists in the same season for the third time in his career … led the Heat in scoring 62 times, in assists 57 times, in minutes 45 times and in steals on 43 occasions … also led Miami in blocks 22 times … posted 17 double-doubles … scored in double figures a team-high 76 times, including 64 games with 20+ points, 27 games with 30+ points and four 40-point performances … became the Heat’s all-time leader in starts on 4/11 at NYK and in minutes on 4/12 at PHI ... became Miami’s all-time leader in double-figure scoring efforts on 3/20 vs. CHA while also blocking season-high 5 shots … handed out a season-high 14 assists vs. LAL (3/4), including the 3,000th of his career … had his franchise-record streak of scoring in double figures snapped at 148 consecutive games on 2/17 at NJN after suffering a strained left calf just 7 minutes into the game and leaving with 8 points … on 2/4 became Miami’s all-time leader in FGA at CLE … on 1/16 became Miami’s all-time assist leader at OKC … scored season-high 44 points vs. BOS (1/6) … became Heat’s franchise leader in FTA vs. ORL on 12/17 … grabbed season-high 11 rebounds vs. DAL (12/11) … recorded season-high 6 steals vs. NJN (11/14) … on 11/9 became the Heat’s all-time leader in FGM vs. BOS … scored his 10,000th career point and topped the 15,000 minutes played mark vs. CHI on 11/1 … missed four games from 2/19-27 due to a strained left calf which occurred in the first quarter at NJN on 2/17 and one game (4/14) as a healthy scratch on the Inactive List. 2010 PLAYOFFS: Started all five games in Miami’s Opening Round series vs. BOS and averaged 33.2 ppg (.564 FG%, .675 FT%), 6.8 apg, 5.6 rpg, 1.60 spg, 1.60 bpg and 42.0 mpg … led the Heat in minutes, FGM and FGA, FG%, 3PM and 3PA, FTM and FTA, assists and points and tied for the lead in steals … topped the Heat in scoring, assists and minutes in all five games and also led Miami in blocks on three occasions and in steals twice … topped the 20-point plateau in all five games, including three with 30+ points and one 40-point effort … scored at least 26 points in each game of the series and his 33.2 ppg is the highest in franchise history in a five-game series and the second highest in any series … set Heat postseason records in points scored (46), points in a second half (30) and FGM (16) in the Game 4 win on 4/25. Played in 79 games (79 starts) and averaged a league-leading 30.2 ppg (.491 FG%, .765 FT%), 7.5 apg, 5.0 rpg, 2.19 spg, 1.34 bpg and 38.6 mpg … was a two-time NBA Eastern Conference Player of the Month and a three-time NBA Eastern Conference Player of the Week … finished 3rd in the voting for Most Valuable Player and also for the Defensive Player of the Year … led the NBA in points and scoring average and ranked among the league leaders in FTM (2nd) and FTA (2nd), steals (2nd), minutes (6th), assists (8th), blocks (16th) and double-doubles (tied-28th) … his 1.34 bpg average led all guards in the NBA … became the only player in NBA history to total at least 2,000 points, 500 assists, 150 steals and 100 blocks in a season … set single-season career highs in games played, starts, minutes, points, scoring average, FGM and FGA, 3PM and 3PA, assists, steals and blocks … led the Heat in minutes, points, scoring average, FGM and FGA, FTM and FTA, assists, steals, dunks and blocks … topped the Heat in scoring 71 times, in assists on 60 occasions, in minutes 43 times, in steals in 40 games, in blocks 36 times - all team highs … became the first NBA player to lead his team in points at least 70 times and assists at least 60 times in the same season since Nate “Tiny” Archibald accomplished the feat for the Kansas City-Omaha Kings in 1972-73 … scored in double figures in all 79 games he played … scored 20+ points 71 times, 30+ points in 39 games, 40+ points in an NBA-high 13 outings and hit the 50-point plateau on three occasions (tied for the NBA high in 2008-09) … scored 30+ points in a franchise-record four consecutive games on three occasions … posted a career-high 20 double-doubles, tying for the team lead … matched his franchise record with back-to-back 40-point games on 2/28 and 3/2 … led the NBA in scoring average in November (28.9 ppg), December (29.2 ppg), January (28.1 ppg), March (33.7 ppg) and April (33.5 ppg) and ranked 2nd in the NBA and 1st in the Eastern Conference in February (30.9 ppg) … scored a career-high 55 points vs. NYK (4/12) and hit a career-high 6 3-pointers while matching his career high in FGM (19) … became Miami’s all-time leader in points scored on 3/14 vs. UTA … hit a game-winning 3-pointer at the buzzer vs. CHI (3/7) after recording a steal with 3.6 seconds left in double overtime … recorded season-high 7 steals vs. CLE (3/2) … became Miami’s all-time leader in steals on 2/28 vs. NYK … became the Heat’s all-time leader in FTM on 2/2 vs. the LAC … hit at least one 3-point field goal in a career-high 11 consecutive games (2/22 to 3/14) … in the 2/28 win vs. NYK, tied his career highs for points in a quarter (24 in the 4th) and points in a half (32 in the 2nd) … recorded season-high 5 blocks vs. TOR (11/19) … dished season-high 16 assists twice and grabbed season-high 10 rebounds twice … missed one game due to a right hip flexor strain (3/18 at BOS) and was a healthy scratch on the Inactive List the final two games of the season. 2009 PLAYOFFS: Played in seven games (7 starts) for the Heat in their Opening Round series vs. ATL and averaged 29.1 ppg (.439 FG%, .862 FT%), 5.3 apg, 5.0 rpg, 1.57 bpg and 40.7 mpg … set Heat postseason records for scoring average, points scored, FGM and FGA and FTM in a seven-game series … led the Heat in points, minutes, FGM and FGA, 3PM and 3PA, FTM and FTA, assists and blocks … topped the Heat in scoring in all seven games and also led Miami in minutes and assists five times each … scored in double figures in all seven games, including six games with 20+ points, three games with 30+ points and one 40-point performance … recorded a postseason career high in 3PM (6) in the Game 2 win at ATL on 4/22, joining teammate Daequan Cook as the only pair of teammates to each hit at least 6 treys in the same NBA playoff game. Played in 51 games (49 starts) and averaged 24.6 ppg (.469 FG%, .758 FT%), 6.9 apg, 4.2 rpg, 1.71 spg and 38.3 mpg … led the Heat in scoring average, points scored, FGM, FTM and FTA, assists, assists per game, steals per game and minutes per game and tied for the team high in steals … ranked 16th in the NBA in FTA and 18th in FTM … topped the Heat in scoring a team-high 37 times and also led in assists a team-high 39 times, in steals 21 times, in minutes on 17 occasions and in blocks in 15 contests … scored in double figures 50 times, including team highs in 20-point games (34), 30-point games (18) and 40-point games (3) … handed out double-figure assists a team-high eight times … tallied nine double-doubles, including in four consecutive games from 12/3-9 to match his career high … dished season-high 12 assists at DET (2/6) … set franchise individual records for points in a half (32 in the 2nd) and consecutive points scored (18 straight in the 4th quarter) vs. CLE (1/21) and also tied the franchise record for FGA in a half (21 in the 2nd) … scored season-high 48 points vs. ORL (12/28) and became the first player in Heat history to hit at least 15 FGA and 15 FTA in the same game when he finished with 16 of each … grabbed season-high 10 rebounds at POR (12/6) … notched season-high 5 steals at UTA (12/3) … participated in the Skills Challenge at All-Star Weekend for the third consecutive year and finished in 4th place … missed 30 games due to injury. Played in 51 games (50 starts) and averaged 27.4 ppg (.491 FG%, career-high .807 FT%), 7.5 apg, 4.7 rpg, 2.10 spg, 1.22 bpg and 37.9 mpg … three-time Eastern Conference Player of the Week (weeks ending 1/14, 2/4, 2/11) … led the Heat in scoring average, points, FGM and FGA, FTM and FTA, assists and steals … ranked among the NBA leaders in FTM (13th) and FTA (16th) … led the Heat in scoring 43 times, in assists on 39 occasions, in steals 32 times, in minutes in 31 contests and in blocks 13 times … scored in double figures a team-high 49 times, including 43 games with 20+ points, 23 games of 30+ points and three 40-point performances … set a franchise record for consecutive 25-point games with nine (1/30-2/21) and had a streak of 20 consecutive 20-point games (1/7-2/21), marking the second longest consecutive 20-point streak in franchise history … handed out double-figure assists a team-leading 12 times … posted 15 double-doubles … set a franchise record for points in a quarter when he dropped 24 of his game- and season-high 41 points in the 4th vs. CLE (2/1), and also set career highs in both FTM (23) and FTA (24) in that game … notched season-high 6 steals at UTA (1/13) … his 33-point, season-high 15-assist performance vs. ORL (11/24) marked the first time in franchise history a Heat player had at least 30 points and 15 assists in the same game … won the Skills Challenge at All-Star Weekend for the second consecutive year … recorded season highs with 11 rebounds (twice) and four blocks (twice) … missed a total of 30 games due to injury and one game (4/18) as a healthy scratch on the inactive list. 2007 PLAYOFFS: Started all four games for the Heat vs. CHI and averaged 23.5 ppg (.429 FG%, .688 FT%), 6.3 apg, 4.8 rpg, 1.25 spg and 40.5 mpg … led the Heat in points, FGM and FGA, FTM and FTA, assists and minutes … had 20+ points in each of the four contests … in addition to leading the Heat in scoring all four contests, he also topped the club in minutes and assists in all four games and in steals and blocks once each. Played in 75 games (75 starts) and averaged 27.2 ppg (.495 FG%, .783 FT%), 6.7 apg, 5.7 rpg, 1.95 spg and 38.6 mpg … named Eastern Conference Player of the Month for February and was a two-time Eastern Conference Player of the Week (weeks ending 12/4, 1/1) … named a starter in the All-Star Game for the first time and finished with 20 points, 4 rebounds, 3 assists, 2 steals and 1 block, and hit the game-winning shot … set career highs and franchise single-season records in FTM (629) and FTA (803) … ranked among the NBA leaders in scoring average (5th), steals (6th), assists per game (tied-10th), minutes per game (tied-19th) and FG% (tied-27th) … led the Heat in minutes, FGM and FGA, FTM and FTA, assists, steals, points and scoring average … led the Heat in scoring 58 times, in assists 51 times, in minutes on 46 occasions, in steals in 44 contests, in rebounds 11 times and in blocks on 10 occasions … scored in double figures 74 times, including 60 games with 20+ points, 34 games with 30+ points and four 40-point efforts … handed out double-figure assists 10 times … recorded 16 double-doubles and two triple-doubles (1/4 at NO/OKC and 1/13 at SEA) … scored season-high 44 points at CLE (4/1) … became the first Heat player to record back-to-back 40-point games (3/8-10) … scored Miami’s final 17 points, including the game-winning shot with 2.3 seconds remaining vs. DET (2/12) to finish with 37 points; his 17 consecutive points to end the game are a Heat franchise record for consecutive points to end a game and rank tied for the second longest streak for any point in a game … posted 4 blocks vs. LAC (1/30) … dished season-high 14 assists at SEA (1/13) … notched 6 steals at POR (1/8) … posted season-high 11 rebounds twice … won the Skills Challenge at All-Star Weekend … missed five games due to injury and was a healthy scratch on the Inactive List for the final two games of the regular season. 2006 PLAYOFFS: Played in 23 games (all starts) for the NBA Champion Heat and averaged 28.4 ppg (.497 FG%, .808 FT%), 5.9 rpg, 5.7 apg, 2.22 spg, 1.13 bpg and 41.7 mpg … named the NBA Finals MVP, becoming the fifth youngest player in NBA history to receive the honor … led Miami in minutes, points, FGM and FGA, FTM and FTA, assists and steals … ranked among the NBA postseason leaders in steals (2nd), scoring average (4th), assists per game (9th), minutes per game (11th), blocks per game (17th), steals-to-turnover ratio (17th) and FG% (tied-17th) … led the Heat in scoring average in all four series … topped the Heat in scoring and assists a team-high 18 times each, in minutes on 16 occasions, in steals 15 times, in blocks in 10 contests and in rebounds twice … scored in double figures in all 23 games … scored 20+ points in 22 contests, including 11 games with 30+ points and a pair of 40-point performances … recorded six double-doubles … his .896 accuracy from the free throw line in the Opening Round series vs. CHI was his highest in a postseason series … .617 field goal accuracy in the Conference Finals vs. DET marks his highest FG% in a postseason series … became Miami’s all-time postseason scoring leader in Game 2 at DET (5/25) … his 34.7 ppg vs. DAL in the Finals marked the highest single-series scoring average in Heat postseason history … scored 43 points and recorded postseason career highs and franchise postseason records in FTM (21) and FTA (25) in Game 5 vs. DAL (6/18) and matched his postseason high in FGA with 28; his 21 FTM in Game 5 set an NBA Finals record … posted 36 points, 10 rebounds, 5 assists, 4 steals and 3 blocks in the decisive Game 6 victory on 6/20; the double-double was his second of the Finals … recorded postseason career-high 13 rebounds in Game 3 on 6/13 and also stole a Dirk Nowitzki inbounds pass with 0.3 seconds remaining to secure the Heat’s 2-point victory, Miami’s first-ever NBA Finals win … his 16 steals in the Finals vs. DAL tied the NBA Finals record for steals in a six-game series held by Julius Erving (1977), Magic Johnson (1980) and Larry Bird (1986). Played in 77 games (77 starts) and averaged 24.1 ppg (.478 FG%, .762 FT%), 6.8 apg, 5.2 rpg, 1.57 spg, 1.06 bpg and 38.6 mpg … selected to first NBA All-Star Game as a reserve and started for the Sophomores in the Rookie Challenge game during All-Star Weekend … selected NBA Eastern Conference Player of the Month for December and the NBA Eastern Conference Player of the Week (week ending 11/8) … ranked among the NBA leaders in scoring average (9th), assists (tied-9th), minutes per game (tied-12th) and steals per game (13th) … ranked 1st in the NBA in blocks (82) among guards … increased his scoring average by 7.9 points over his rookie year, the largest increase in the NBA by a player who averaged at least 10.0 points the previous season … joined Allen Iverson and LeBron James as the only players to rank in the top 10 in the NBA in 2004-05 in both points and assists … led the Heat in minutes, FGA, FTM, assists, steals and scoring average … was Miami’s top scorer a team-leading 43 times and also led the team in assists a team-high 55 times, in minutes 45 times, in steals 39 times and in blocks in 21 games … scored in double figures a team-high 75 times, including a team-high 56 games with 20+ points, a team-high 16 games with 30+ points and one 40-point effort … handed out double-figure assists a team-high 13 times and recorded 16 double-doubles … scored season-high 48 points in season-high 49 minutes at PHI (4/14) … recorded his first triple-double with 31 points, 10 assists and 10 rebounds in DET (12/30) … hit a pair of game-winning buzzer-beaters; his shot at the buzzer on 3/15 gave the Heat a 98-96 win at NYK and clinched Miami’s first Southeast Division championship … hit a pair of free throws with one second left vs. UTA (11/19) to force OT and then hit the game-winning shot with 0.1 seconds left in OT to give the Heat a 2-point win over the Jazz … dished season-high 12 assists three times, grabbed season-high 10 rebounds four times, posted season-high 5 steals twice and blocked season-high 4 blocks twice … missed four games due to injury and was a DNP-CD once (4/19). 2005 PLAYOFFS: Started each of the 14 games in which he played and averaged 27.4 ppg (.484 FG%, .799 FT%), 6.6 apg, 5.7 rpg, 1.57 spg, 1.14 bpg and 40.8 mpg … missed one game (6/4 vs. DET) due to injury with a strained right rib muscle which occurred in the 3rd quarter of Game 5 (6/2) … led the Heat in scoring average, points, FGM and FGA, FTM and FTA, assists and steals … scored in double figures in all 14 games, including 11 games with 20+ points, seven 30-point games and a pair of 40-point games … ranked among the NBA postseason leaders in scoring average (4th), assist average (5th), minutes per game (10th), steals per game (13th), FG% (22nd), blocks per game (23rd) FT% (27th) … topped the Heat in scoring and minutes nine times each, in assists on 10 occasions, and in blocks and steals six times apiece … handed out a Heat postseason record 15 assists in Game 2 vs. WAS on 5/10 … scored a game-high 40 points and established Miami postseason records for FGA (28) and points in a 4th quarter (20) in Game 2 vs. DET on 5/25. Played in 61 games (56 starts) and averaged 16.2 ppg – a Heat rookie record for scoring (.465 FG%, .747 FT%), 4.5 apg, 4.0 rpg, a team-leading 1.41 spg and 34.9 mpg … started for the Rookies in the Rookie Challenge at All-Star Weekend in Los Angeles … named Eastern Conference Player of the Week on 2/23, becoming the first Heat rookie to earn league Player of the Week honors and the 21st in NBA history … among the NBA’s rookie leaders in FG% (2nd), steals per game (2nd), scoring average (3rd), assists per game (4th), minutes per game (4th), blocks per game (7th) and rebounds per game (11th) … led Miami in scoring 21 times, in assists 22 times, in steals on 21 occasions and in blocks 18 times … had season-high 6 steals vs. NOH (3/16) … set a Heat rookie single-game record with 15 FGM vs. ATL (2/15) … scored in double figures 51 times with 19 games of 20+ points and three 30-point games … had one double-double with 27 points and a season-high 10 rebounds at ORL (2/11) … scored season-high 33 points vs. GSW (12/21) … recorded season highs with 8 assists (five times), 2 blocks (six times) and 44 minutes (twice) … missed a total of 21 games due to injury. 2004 PLAYOFFS: Played 13 games (13 starts) for Miami and averaged 18.0 ppg (.455 FG%, .787 FT%), 5.6 apg, 4.0 rpg, 1.31 bpg and 39.2 mpg … topped the Heat in points, scoring average, FG%, FGM and FGA, FTM and FTA and assists … led the Heat in scoring seven times, including five of the six Eastern Conference Semifinal games vs. IND and in assists 12 times … scored in double figures 12 times, including seven 20-point games … recorded a pair of double-doubles … became the only rookie in Heat history to lead the team in scoring average in the postseason … became just the fourth rookie since the shot clock era began in 1954-55 to lead his team in scoring average and assist average in the playoffs joining Stephon Marbury (1997), Michael Jordan (1985) and Billy Ray Bates (1980) … his team-high 27-point effort at NOH on 5/2 in Game 6 set a Heat rookie single-game scoring record and was the top single-game scoring performance by a Heat player in the 2004 playoffs … hit a game-winning 10-foot running jumper with 1.3 seconds left in Game 1 vs. NOH snapping a 79-79 tie and nailed a 3-pointer in Game 5 of the same series that snapped a 80-80 tie with 54.4 seconds left and put Miami ahead to stay … scored 21 points in his postseason debut vs. NOH on 4/18, marking the highest scoring debut by a Heat rookie in the playoffs. Selected by Miami in the first round (5th overall) of the 2003 NBA Draft … signed by the Heat on 8/19/03 … signed a contract extension with Miami (7/12/06) … re-signed with the Heat (7/9/10) … again signed with Miami (7/15/14) … re-signed with the Heat (7/10/15) ... signed by the Bulls as a free agent (7/15/16). Played two seasons at Marquette before becoming an early entry candidate after his junior year … started all 65 games in which he appeared and averaged 19.7 ppg (.494 FG%, .745 FT%), 6.5 rpg, 3.9 apg and 2.31 spg … had his number (3) retired by Marquette on 2/3/07 and was enshrined into the Marquette M Club Hall of Fame in August 2009 as an individual and also as part of the 2002-03 men’s basketball team … became the first Marquette player since 1978 to be named a First Team All-American by The Associated Press … earned a spot on the Wooden Award All-America team and was one of five finalists for the Wooden Award after helping lead the Golden Eagles to the 2003 Final Four. 2002-03: Named the Conference USA Player of the Year, Defensive Player of the Year and First Team All Conference USA … led Conference USA (22nd nationally) in scoring and set a Marquette single-season scoring record (710 points) … named the Most Outstanding Player of the 2003 Midwest Regional Final … in the 83-69 victory vs. Kentucky, which vaulted Marquette into the Final Four and ended UK’s 26-game winning streak, he amassed just the ninth triple-double in NCAA Tournament history with 29 points, 11 rebounds and 11 assists. 2001-02: Earned Honorable Mention All-America honors from The Associated Press and First Team All Conference USA honors … led the Golden Eagles in scoring (8th in C-USA), rebounding and steals (1st in C-USA) … sat out the 2000-01 season as an NCAA partial qualifier. Full name is Dwyane Tyrone Wade, Jr. … nickname is “D. 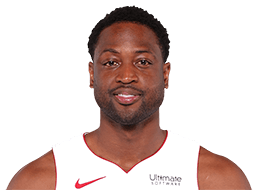 Wade” … married actress Gabrielle Union on 8/30/14 … has two sons, Zaire and Zion, and a nephew, Dahveon, whom he is raising … official website is www.dwyanewade.com ... was a broadcasting major at Marquette … served as an ABC guest analyst during the 2015 NBA Finals … completed an executive course in sports and entertainment management at Harvard University in the summer of 2015 … inducted into the Greater Miami Chamber of Commerce Sports Hall of Champions in September 2015 … says his dream is to “leave the world a better place than I found it,” and to that mission the Wade’s World Foundation has a goal of providing support to various education, health and family service programs, in particular those that benefit underserved communities … received a Humanitarian Award at the 2013 BET Awards for his commitment to excellence and dedication to community and worldly charitable causes … shared USA Weekend magazine’s 15th Annual Most Caring Athlete Award in October 2007 with Steve Nash … teamed up with Alonzo Mourning to co-host The Summer Groove for three years (2008-10) and to form the Athletes Relief Fund for Haiti in January 2010 to assist the victims of the earthquakes in Haiti … in August 2007 he hosted “A Week of Wade’s World in South Florida”, a week-long series of events that touched hundreds of South Florida kids; the week-long event included a basketball camp, fulfilling the dreams of Make-A-Wish children, a reading event and a school supplies shopping spree for local children … has partnered with the Make-A-Wish Foundation on several occasions … hosted his annual “3 Under the Tree” holiday events to benefit the South Florida community … hosts a three-day free camp for over 600 kids in his hometown of Robbins, IL … also hosts an annual youth camp (The D. Wade All-Star Basketball Camp) each summer in South Florida and the past five years has hosted The Dwyane Wade Fantasy Camp for adults who are at least 35 years old ... his memoirs “A Father First: How My Life Became Bigger Than Basketball” earned a spot on the New York Times Bestseller List … received the Father of the Year Award in June 2007 from the Father’s Day Committee and the National Fatherhood Award in February 2012 from the National Fatherhood Initiative … in 2011 was appointed to President Obama’s fatherhood task force … was challenged by First Lady Michelle Obama for the fifth anniversary of her Let’s Move campaign … in 2007-08 served as the national spokesperson for the Cartoon Network’s Rescuing Recess program to protect and revitalize recess in schools across the country … named to The Sporting News NBA Good Guys list in July 2004 … featured in Vogue’s June 2012 Olympics issue … named by the Wall Street Journal as the NBA’s Fashion Ambassador in September 2012 … hosts his annual A Night on the RunWade fashion fundraiser in Miami to benefit his foundation … received the ESPY Awards for Best Breakthrough Athlete (2005) and Best NBA Player (2006) … partnered with Staples in the summers of 2007 and 2008 to launch the Staples Dream Park Challenge with D. Wade, a park improvement initiative in South Florida … also enjoys football and lists the Chicago Bears and the University of Miami as his favorite teams … enjoys buying and collecting shoes … wears size 15 sneakers.